A hallmark of the Obama administration has been the use of unmanned drones and a presidential “kill list,” killing hundreds of people, including children, in Pakistan, Afghanistan, Yemen, Iraq, and Somalia. World Can’t Wait is part of the kNOwdrones tour which brings replica Reaper drones to shopping areas and schools, and will be in the streets at the Democratic National Convention in Charlotte NC, September 3-7. 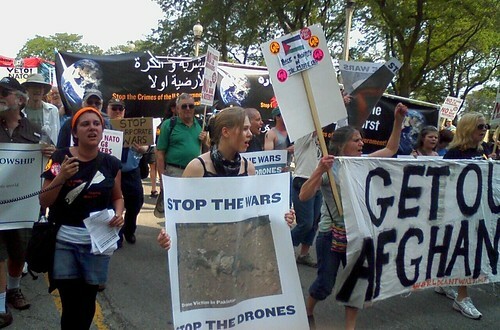 While protesting the NATO Summit in Chicago, May 2012, World Can't Wait brought the victims of US/NATO wars to the fore. 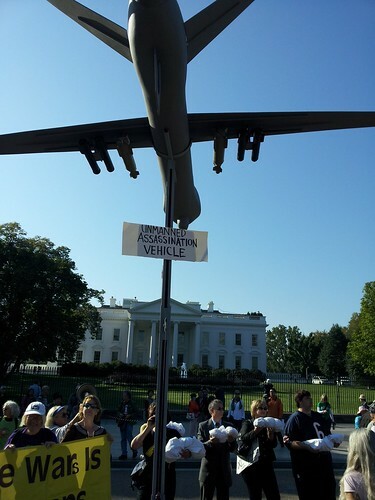 Replica drone in action while protesting the war in Afghanistan in Washington, DC, fall 2011. War Criminals Watch, a project of World Can’t Wait, tracks the public appearances of official in the former Bush administration, to publicly expose and challenge their role in committing war crimes. We assist students in research, and supply materials for visual protest on campus through warcriminalwatch.org and firejohnyoo.net. Graduates stand and turn their backs in protest against John Brennan, Bush and Obama's drone advisor, at Fordham University. Berkeley Law School graduates participate in protest against faculty member (and Bush regime torture lawyer) John Yoo. 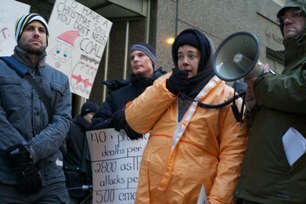 You can count on World Can’t Wait organize protest when it’s urgently needed. As the U.S. began threatening war on Iran this year, we pulled together people in 80 cities to protest. We produced a compilation on DVD of material about the “Collateral Murder” incident released to the world by Wikileaks which is free for group showings and school classes. Volunteers in our national office, mailings, 4 websites, conference calls, educational forums, and the production of outreach materials contribute information and leadership to people across the country, especially those who may not have a protest community where they live. 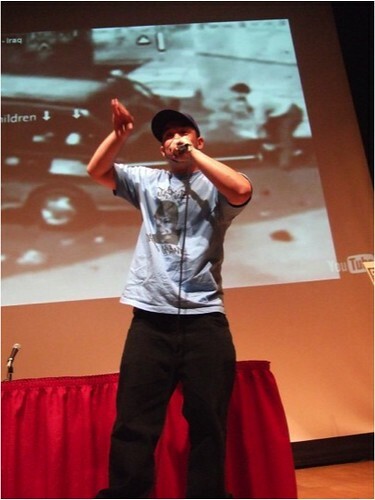 Using the Collateral Murder video in a We Are Not Your Soldiers school presentation.